Situated on Coolangatta Mtn, Chris and Rhonda Warters new property required some defining elements to add their own touch. 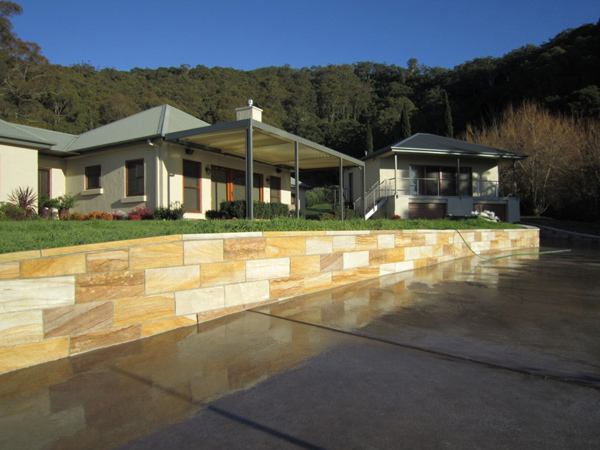 A project completed over 3 years included a 250 metre dry stone retaining wall, a sandstone buffer wall to the driveway, and some fresh sandstone paving that have all contributed to settling this property into it’s environment. Chris and Rhonda – always happy and in the best of spirits were a pleasure to deal with. We enjoyed being part of their long term plan for their new home. Surrounding Chris and Rhonda’s home, the true colours of the sandstone wall can be seen in the morning sun. Constructed using extra large 600 x 1200 paving slabs, this area now ties in well with the sandstone used elsewhere on the property and gives the home a fresh new look that will stand the test of time. Just as important to us as providing quality stonework, we like to leave a project in the best condition we can. Presentation is everything.